The moment of triumph: Nico Rosberg celebrates his first world title at the Abu Dhabi. 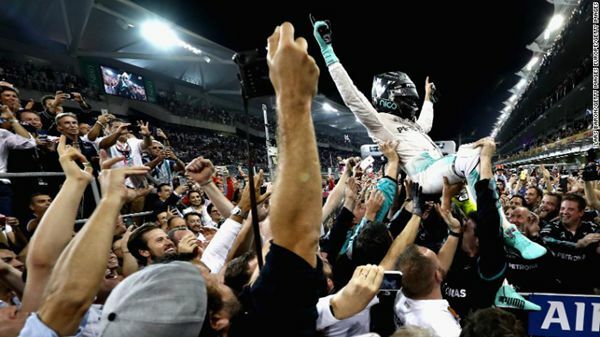 British F1 pilot Lewis Hamilton won the Abu Dhabi Grand Prix on Sunday evening, but his Mercedes-GP teammate Nico Rosberg from Germany finished second, enough to win a 33rd F1 title. Rosberg's compatriot and Scuderia Ferrari pilot Sebastian Vettel, a three-time winner of the Abu Dhabi GP, came in second, while Verstappen finished third in front of 60,000 race aficionados on the Yas Marina F1 Circuit in the United Arab Emirates capital of Abu Dhabi. Belgian-Dutch race driver Max Verstappen came in fourth. The 31-year-old German Mercedes driver started in P2. Rosberg kept station behind his teammate throughout, before crossing the finish line in second place. Rosberg clinched 385 points this season, only five more than Hamilton, who was criticized by commentators for his race tactics during the neck-to-neck race. At the end, the two smiling rivals were seen on the podium, as Hamilton congratulated Rosberg with a handshake. With his victory, Rosberg filled the shoes of his Finnish father Keke Rosberg who won the F1 Championship in 1982 (Rosberg's German ancestry comes from his mother). Al Tareq Al Ameri, CEO of the Yas Marina Circuit, commented on Rosberg's victory. "Congratulations to Nico on becoming FIA Formula 1 Drivers' Champion, and a special thanks to all teams and drivers for putting on such a fantastic display of racing for our sell-out crowd to enjoy," he said.